Chest radiograph of an infant with bronchopulmonary dysplasia. With advances in medical management, BPD has become the most common cause of chronic lung disease (CLD) in children. [2, 8, 9, 10, 11, 12] The incidence of BPD varies between 5% and 40%, and it is is common in preterm infants: 10% of infants weighing less than 1500 g and 20% of those weighing less than 1000 g develop this condition. With advances in therapy, BPD is currently uncommon after 30 weeks of gestation or in infants weighing more than 1200 g.
In stage 1 (1-3 d), the pathologic appearances of BPD are identical to those of hyaline membrane disease and involve the presence of hyaline membranes, atelectasis, vascular hyperemia, and lymphatic dilatation. In stage 2 (4-10 d), lung destruction due to stretching of the terminal bronchioles results in ischemic necrosis of airways, inducing immediate reparative changes in the lungs. Bronchiolar obstruction is seen in this stage, and bronchial necrosis, peribronchial fibrosis, and squamous metaplasia produce obliterative bronchiolitis. Hyaline membranes can persist into this stage. Emphysematous coalescence of alveoli is seen. Stage 3 (11-20 d) involves progressive repair of the lung, with a decreased number of alveoli, compensatory hypertrophy of the remaining alveoli, and hypertrophy of bronchial-wall muscle and glands. Regenerating clear cells and exudation of alveolar macrophages and histiocytes into airways are seen. Airtrapping, pulmonary hyperinflation, tracheomegaly, tracheomalacia, interstitial edema, and ciliary dysfunction may be present. In stage 4 (>1 mo), emphysematous alveoli are seen. Pulmonary hypertension eventually results from chronic lung damage, and cor pulmonale ensues. Fibrosis, atelectasis, a cobblestone appearance due to uneven lung aeration, and pleural pseudofissures are often seen. Pulmonary hypertension is caused by thickening of the intima of pulmonary arterioles. Marked hypertrophy of peribronchiolar smooth muscle is present. Pathologic changes in long-term survival are interstitial fibrosis, hyperinflation, reduced number of alveoli, reduction in alveolar surface area, arrested acinar development, pseudofissures, airway hyperplasia, and atelectasis. Sequelae of CLD include pulmonary arterial hypertension and right-sided cardiac failure. Tracheobronchomegaly, tracheomalacia, and ciliary dysfunction are associated findings. BPD should be differentiated from CLD, which is oxygen dependence at 28 days or 36 weeks of gestation and which is also seen in patients ventilated because of apnea or meconium aspiration. Persistent pulmonary hypertension of the newborn (PPHN) is another consideration. Infants with Wilson-Mikity syndrome, a CLD that occurs in 2% of infants who were born preterm with a low birth weight (ie, those without a history of high-pressure ventilation or exposure to high oxygen concentrations), do not develop RDS. [13, 14] This syndrome is commonly seen between age 1 and 2 months, and most cases slowly resolve. Chest radiographic findings are normal in the first week, but later they are similar to those of BPD, with hyperinflation, stranding, streaky infiltrates, and cystic changes. Radiographic changes persist for a few months to years after clinical findings resolve. Four stages of radiographic changes of BPD have been described: stage I, which is RDS seen in the first week; stage II, which includes generalized haziness and plethora in the second week; stage III, which involves cystic changes and stranding in the third week; and stage IV, which is characterized by hyperinflation,  extensive stranding, and an enlarged heart in the fourth week. In stage 1 (<3 days), characteristic features of RDS are seen, as can complications of RDS (eg, pneumothorax and pulmonary interstitial emphysema [PIE]). In stage 2 (4-10 days), persistent radiographic findings should alert the clinician to the development of BPD. Fine or course interstitial opacities are frequently seen. This stage has a diffuse distribution and no specific lobar predilection. In severe cases, changes are widespread and coarse. Stage 3 (10-20 days) is characterized by a classic bubbly appearance and irregular dense areas, opaque areas. In stage 4 (>1 month), images show hyperexpansion of the lung, expanding bubbles, and strands. When present, air trapping is more common in the lower lobes than in the upper lobes. Pulmonary hyperinflation is seen in the most severe cases. Clearly defined Northway stages are hardly seen in current practice, in which RDS is not a prerequisite for BPD. 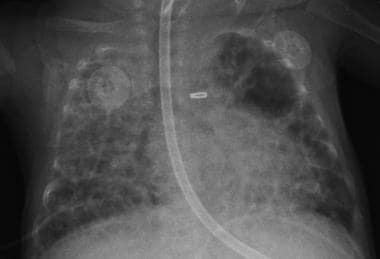 By day 3, radiographic changes can be seen as pulmonary edema. By 1 week, images may show interstitial edema, septal lines, and loss of the clear outlines of pulmonary vessels. Strandlike opacities may be due to lymphatic engorgement or atelectasis. Cardiomegaly may be seen if PDA or fluid overload is present. The changes are early and severe if they are caused by infections. Infection and fluid overload are difficult to distinguish on radiographs alone. By the third week, fibrosis and/or atelectasis may be observed in upper lobes. Hyperinflation can produce right ventricular enlargement, prominent hila due to pulmonary arteries, and pruning of the peripheral pulmonary arteries. In rare cases, the trachea is enlarged and softened. The anteroposterior (AP) diameter of the chest can be narrow, the cause of which is still unknown. Air trapping increases the AP diameter of the chest. Hyperexpansion due to scarring and/or hyperplasia of mature alveoli, alveolar-wall distention, or diminished bronchial diameter is seen. Focal hyperlucent areas can be present because of expiratory air trapping. Development of viral and other bacterial pneumonias can interrupt clearing of the radiographic findings. These pneumonias produce consolidation and atelectatic changes. Type I is hazy shadowing without air bronchograms or focal hyperinflation. Type II is less common than type I and is characterized by large-volume lungs and coarse, linear shadows due to scarring and cyst formation. Modern treatment produces only 2 types of CLD: classic or severe, which can be new or mild. The appearance depends on a balance among inflammation, injury, healing, growth and maturation, prematurity, low birth weight, neonatal respiratory illness, and treatment. The presence of radiographic abnormalities 2 weeks after the onset of RDS is usually due to BPD. Conditions that mimic the radiologic appearances of BPD are cardiac failure, pulmonary edema, infections, and PIE. In stage 1, HRCT scans show changes of RDS, pneumothorax, and PIE. In stage 2, interlobular septal thickening is the most common finding. On expiratory scans, air trapping is well depicted as abnormal lucencies. Hyperinflation, areas of atelectasis, consolidation, prominent pulmonary arteries, and an enlarged heart are other features. In severe disease, scans show marked distortion of the lung parenchyma, large cysts, coarse fibrosis, and pulmonary hypertension. Stage 3 is characterized by linear atelectasis and fibrotic changes, as well as gradual clearing of areas of attenuation. Marked ventilation-perfusion mismatch due to the destruction of the lung is observed. Another finding is the loss of gravity-dependent flow distribution. However, although nuclear medicine studies are nonspecific investigations and not useful in diagnosing BPD, perfusion scintigraphic findings are well correlated with the clinical severity of the disease. Walkup LL, Woods JC. Newer Imaging Techniques for Bronchopulmonary Dysplasia. Clin Perinatol. 2015 Dec. 42 (4):871-87. [Medline]. Bancalari E. Neonatal chronic lung disease. In: Neonatal Perinatal Medicine: Diseases of the Fetus and Infant. 6th ed. 1997: 1082. Aukland SM, Rosendahl K, Owens CM, Fosse K, Eide GE, Halvorsen T. Neonatal bronchopulmonary dysplasia predicts abnormal pulmonary HRCT in long term survivors of extreme preterm birth. Thorax. 2009 Jan 21. [Medline]. May C, Prendergast M, Salman S, Rafferty GF, Greenough A. Chest radiograph thoracic areas and lung volumes in infants developing bronchopulmonary dysplasia. Pediatr Pulmonol. 2009 Jan. 44(1):80-5. [Medline]. Czarnecki ŁM. Assessment of chest X-ray images in newborns with respiratory disorders. Kardiochir Torakochirurgia Pol. 2015 Mar. 12 (1):83-6. [Medline]. Moya MP, Bisset GS, Auten RL, et al. Reliability of CXR for the diagnosis of bronchopulmonary dysplasia. Pediatr Radiol. 2001 May. 31(5):339-42. [Medline]. Walkup LL, Tkach JA, Higano NS, Thomen RP, Fain SB, Merhar SL, et al. Quantitative Magnetic Resonance Imaging of Bronchopulmonary Dysplasia in the Neonatal Intensive Care Unit Environment. Am J Respir Crit Care Med. 2015 Nov 15. 192 (10):1215-22. [Medline]. Carey BE, Trotter C. Bronchopulmonary dysplasia. Neonatal Netw. 2000 Apr. 19(3):45-9. [Medline]. Davis JM, Rosenfield WN. Chronic lung disease. Avery's Diseases of the Newborn. 7th ed. Philadelphia, Pa: Harcourt Brace Jovanovich;. 1998: 509-31. Northway WH. An introduction to bronchopulmonary dysplasia. Clin Perinatol. 1992 Sep. 19(3):489-95. [Medline]. Srisuparp P, Marks JD, Khoshnood B, Schreiber MD. Predictive power of initial severity of pulmonary disease for subsequent development of bronchopulmonary dysplasia. Biol Neonate. 2003. 84(1):31-6. [Medline]. Lefkowitz W, Rosenberg SH. Bronchopulmonary dysplasia: pathway from disease to long-term outcome. J Perinatol. 2008 Dec. 28(12):837-40. [Medline]. Eber E, Zach MS. Long term sequelae of bronchopulmonary dysplasia (chronic lung disease of infancy). Thorax. 2001 Apr. 56(4):317-23. Glowacka E, Lis G. [Bronchopulmonary dysplasia - early and long-term pulmonary sequelae.]. Pneumonol Alergol Pol. 2008. 76(6):437-445. [Medline]. Trotter C, Carey BE. Radiology basics, II: RDS and BPD. Neonatal Netw. 2000 Apr. 19(3):37-40. [Medline]. Azizkhan RG, Grimmer DL, Askin FB, et al. Acquired lobar emphysema (overinflation): clinical and pathological evaluation of infants requiring lobectomy. J Pediatr Surg. 1992 Aug. 27(8):1145-51; discussion 1151-2. [Medline]. Northway WH, Rosan RC, Porter DY. Pulmonary disease following respirator therapy of hyaline-membrane disease. Bronchopulmonary dysplasia. N Engl J Med. 1967 Feb 16. 276(7):357-68. [Medline]. Palta M, Sadek M, Barnet JH, et al. Evaluation of criteria for chronic lung disease in surviving very low birth weight infants. Newborn Lung Project. J Pediatr. 1998 Jan. 132(1):57-63. [Medline]. Griscom NT, Wheeler WB, Sweezey NB, et al. Bronchopulmonary dysplasia: radiographic appearance in middle childhood. Radiology. 1989 Jun. 171(3):811-4. [Medline]. Aquino SL, Schechter MS, Chiles C, et al. High-resolution inspiratory and expiratory CT in older children and adults with bronchopulmonary dysplasia. AJR Am J Roentgenol. 1999 Oct. 173(4):963-7. [Medline]. van Mastrigt E, Logie K, Ciet P, Reiss IK, Duijts L, Pijnenburg MW, et al. Lung CT imaging in patients with bronchopulmonary dysplasia: A systematic review. Pediatr Pulmonol. 2016 May 5. [Medline]. Howling SJ, Northway WH, Hansell DM, et al. Pulmonary sequelae of bronchopulmonary dysplasia survivors: high-resolution CT findings. AJR Am J Roentgenol. 2000 May. 174(5):1323-6. [Medline]. Oppenheim C, Mamou-Mani T, Sayegh N, et al. Bronchopulmonary dysplasia: value of CT in identifying pulmonary sequelae. AJR Am J Roentgenol. 1994 Jul. 163(1):169-72. [Medline]. Korones SB. Complications of bronchopulmonary dysplasia, air leak syndromes, and retinopathy of prematurity. In: Assisted Ventilation of the Newborn. 3rd ed. Philadelphia, Pa: WB Saunders;. 1996. Shennan AT, Dunn MS, Ohlsson A, et al. Abnormal pulmonary outcomes in premature infants: prediction from oxygen requirement in the neonatal period. Pediatrics. 1988 Oct. 82(4):527-32. [Medline]. Slovis TL. Congenital and acquired lesions (most causing respiratory distress). In: Caffey's Pediatric Diagnostic Imaging. Vol 1. 10th ed. St Louis, Mo: Mosby/Elsevier Science;. 2004: 95-8. The authors and editors of eMedicine gratefully acknowledge the contributions of previous coauthor Dr Biswaranjan Banerjee to the development and writing of this article.